Many people prepare for their retirement by making plans for travel, hobbies and spending time with family and friends. But not Webster alum Susan Ruiz, who earned her MBA online from Webster in 2011. Eyeing an end to her 38-year career with AT&T San Antonio, where she most recently served as Regional Vice President of National Business Markets, Ruiz decided to forego relaxation in retirement. Instead, she hit the books again and earned another Webster degree – this one an MS in Finance – to help prepare for what she calls her post-retirement career. Ruiz, who earned that second master’s degree at the end of the fall 2015 semester, now volunteers at the San Antonio Food Bank, working on projects with the organization’s chief financial officer. She also is a newly elected member of Webster’s Alumni Association Board of Directors, after leading the Association’s San Antonio Chapter since 2012. Ruiz has been involved with the San Antonio Food Bank for the past decade, and also has organized the San Antonio Alumni Association chapter’s annual Webster Works Worldwide project there for several years. Ruiz first heard about Webster in 2002 from a colleague who had earned an MBA at Webster’s Fort Sam Houston campus. In 2009, Ruiz took the plunge and met with the former director of Webster’s San Antonio campus, Joyce Peavy. Ruiz’s daughter, Sarah Butler, began working at Webster as a representative at the University’s Lackland Air Force Base campus in 2014, immediately after earning an undergraduate degree at Wayland Baptist University. This past January, she was offered the position as director of Webster’s Fort Sam Houston campus. Today, like her mother, Butler also is a Webster alum. She graduated this spring with a master’s degree in Human Resources Management. 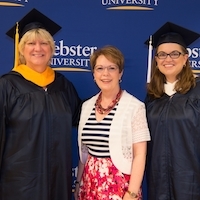 To celebrate their shared Webster connections and accomplishments, Ruiz and Butler traveled to St. Louis to participate in Webster’s 97th Commencement ceremony earlier this month at The Muny in Forest Park.